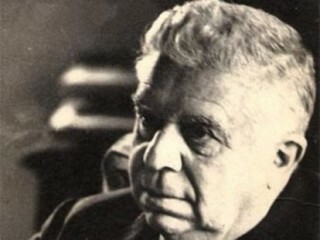 The Italian poet and critic Eugenio Montale was one of the major representatives of Italian hermetic poetry. Eugenio Montale was born on Oct. 12, 1896, at Genoa, and his youth was spent between that city and a property his family had in southern Liguria. He studied literature at the University of Genoa and took voice lessons with the baritone Sivori, but he turned exclusively to literary pursuits after World War I, in which he had served as an infantry officer. In 1927 he moved to Florence to work for a publishing house. There he was director of the Gabinetto Vieusseux from 1929 to 1938, when he was removed from the post because of his indifference to the Fascist regime. Throughout this time Montale contributed regularly to literary journals, such as Solaria, and, being also a perceptive critic, he was the first to point out, in 1925, Italo Svevo's importance as a writer. In 1928 he became head of the Gabinetto Vieusseux Library in Florence and was let go in 1938 due to his anti-Fascist views. He then spent a decade translating English and American literary works into Italian. In 1948 he became editor of a newspaper in Milan. Although it has been suggested that the closed and difficult style of hermetic poetry was a direct result of "inner emigration" during fascism, there is no doubt that artistic tenets played a dominant role in shaping it. Montale, who is one of the virtuosos of its contrived technique of obscuration, found in the resulting bare and arid style an apt vehicle for his pessimistic views of life that only in his later work show signs of moderation. The subject of Montale's poetry is the human condition, considered by and in itself, not this or that historical event. To treat such events would mean for Montale to mistake the essentials for their transitory aspects. Thus, his is the poetry of a man who extricates himself from the accidentals of human existence to perceive its essence. This notion no doubt contributed considerably to the "abstract" and intellectual aspect of his poetry. In Montale's first collection of verse, Ossi di seppia (1925), his desolate and pessimistic picture of life finds its pendant in the austere and arid Ligurian landscape, which forms the backdrop of many of his poems. Although there seems to be no hope of escaping the futility of human existence, in some pieces, such as In limine, there appears already a tendency to see a way out of the existential dilemma, if only for others. The second collection, Occasioni (1939), with its terse style and disconnected imagery, represents a further step in the application of hermetic tenets almost beyond any possible understanding; yet some of its poems belong to the best that were written in Italy in the 20th century. Finisterre (1943) is a reflective and removed reckoning with World War II. In La bufera e altro (1956) there is a noticeable easing of tension and a more balanced relation between the linguistic means and the message they carry. Satura (1971) contains 118 poems written between 1962 and 1970, more than two-thirds of them unpublished until then. The lyrical mode of this collection definitely indicates a departure from Montale's earlier abstraction and a turn toward a more open statement without reticence; it also gives the reader an insight into the poet's own personal sphere. Montale was awarded the Nobel Prize for literature in 1975. He continued to write up until his death at his home in Milan on September 12, 1981. View the full website biography of Eugenio Montale.